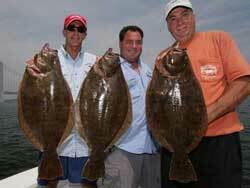 Fluke season is upon us and this season promises to be one of the best in years. However, there are a lot of small fish around. 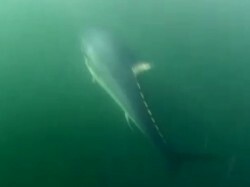 The pros make sure they finely tune their fluke tackle to ensure the best possible presentation for the fluke techniques they are using. 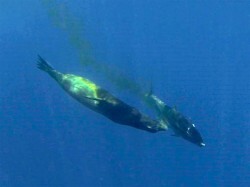 Their are two distinct approaches; light tackle and deep water (heavier tackle). Bucktails are by far the most effective when fishing light tackle. However, the maximum reasonable weight for a bucktail is 6 ounces. Bucktails are most effective when fished vertically. All of the factors listed above impact the presentation. 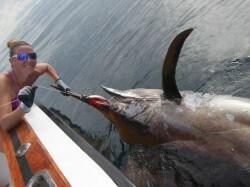 As the presentation becomes less vertical (angler needs to let out line to hold bottom), the technique becomes less effective. As the effect of the factors increases, the weight of the bucktail must also be increased. A fairly stiff spinning rod is required so that the bucktail can be worked (jigged up and down) quickly. Some conditions and locations are just not suitable for light tackle bucktail fluke fishing. Anglers need to shift to heavier casting (conventional) outfits that can handle sinkers up to 16 ounces (extreme conditions). 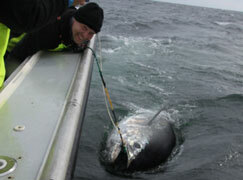 A fairly stiff rod is required because in many cases the depth and drift speed create a significant belly in the line. The angler needs to be able to feel the pickup and the rod needs to have enough beef to set the hook. CLICK HERE FOR FREE FLUKE VIDEO CLIPS AND INSTRUCTION!